McDavid knee braces are some of the most popular braces on the market. They offer a whole range of specially designed braces suitable for anything from a simple knee sprain to complete ligament tears. They are all made of heavy duty material so are very durable and long lasting. McDavid braces have good durability and are very simple to use. People generally rate them very highly. Here I share with you my favourite ones, those that consistently receive great reviews, provide good knee support and are cost effective. 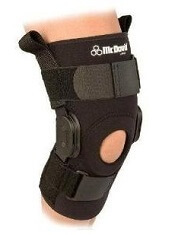 McDavid knee braces are either one size fits all, or are available in five sizes. Simply measure around the centre of your knee and check our size guide below. There are three categories of McDavid knee braces, each offering different levels of support and protection: Basic, Advanced and Elite. These primary McDavid knee braces are suitable for mild knee pain, sprains and instabilities and conditions such as arthritis, bursitis or runners knee. 2)	Open Sleeve Knee Support: Has a hole and support buttress at the front which reduces pressure on the kneecap which can be helpful when there is pain at the front of the knee e.g. from chondromalacia patella, or Runners Knee. Overview: The McDavid elastic knee support is a popular basic pull on sleeve support. It is specially shaped to ensure it fits well, which is something you don’t always get with cheaper brands. It is also seamless behind the knee which reduces friction for extra comfort. 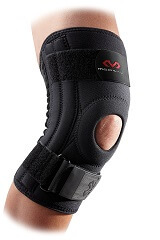 My verdict: A great McDavid knee brace for mild knee pain either following an injury or with ongoing knee problems. It's a great to have in the first-aid kit. Average user rating 4.4/5. Overview: A popular pull on sleeve providing compression and soft tissue support. There is a hole and buttress at the front to reduce pressure on the kneecap, improving comfort and flexion. 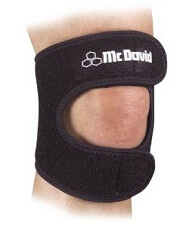 These advanced protection McDavid braces are suitable for mild to moderate ligament instabilities and/or knee pain. Advantages: Wrap-around style braces often fit better and are easier to get on and off than pull on sleeves as you can adjust them to your knee. They tend to stay in place better and can be tightened as swelling reduces. Overview: This is one of the most popular McDavid knee braces for ligament & cartilage injuries and also helps relieve the symptoms of chondromalacia, patellar subluxation and patellar tendonitis. It has special supportive steel springs that strengthen the brace on either side of the knee joint to improve stability and support knee ligaments. The Neoprene material provides soothing heat and compression which relieves knee pain and swelling and promotes healing. My Verdict: This McDavid knee brace is a classic design and is rated highly by users. It is fully adjustable so you don't have to worry about buying the right size. If you are looking to get a bit more support than a classic pull up design, it is well worth the money. Average user rating 4.1/5. 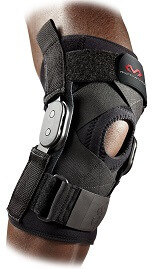 Overview: This McDavid knee brace reduces pain caused by patellar tendonitis (jumpers knee), osgood schlatters, chondromalacia patella and Runners Knee. 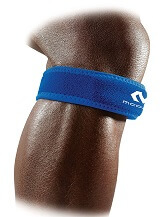 The McDavid Knee Strap reduces forces going through the patella tendon due to a unique tubular buttress which applies constant, mild compression on the patellar tendon. It is perfect for people who do lots of running and/or jumping. Fully adjustable Velcro for perfect fit – one size fits all. Overview: This is a double band knee strap suitable for treating patellar tendonitis (jumpers knee), osgood schlatters, chondromalacia patella and Runners Knee. The extra strap also makes it good for general anterior knee pain around the kneecap as it helps correct patellar tracking (how the kneecap moves) and Illiotibial band (ITB) problems. The adjustable straps provide optimum fit and comfort. It has two adjustable buttresses which can be placed top and bottom to reduce the forces going through the kneecap and patellar tendon, or at the sides to help prevent patellar subluxation. Made of neoprene. My Verdict: I like the fact that you can move the two buttresses to where you most need them. However, the Mueller version is this brace receives better user reviews. Average user rating 4.1/5. Elite level braces are the ultimate in protection. They are designed to provide the maximum level of support for moderate to severe knee instability and pain. Overview: This elite level super heavy duty hinged brace provides maximum protection combining bi-lateral geared hinges and elastic cross strapping for stability and ligament support. This McDavid Brace has fully adjustable straps ensure a perfect fit. The open padded buttress at the front supports the kneecap. The back panel is seamless and perforated making it both comfortable and breathable. Latex free. Perfect for recovering from injuries or surgery. My Verdict: I love the combination of adjustable cross straps along with the hinges providing excellent stability. And the breathable back panel stops the knee getting too sweaty. It is a good purchase if you really need to give your knee maximum support. Average user rating 4.3/5. The McDavid Pro Stabiliser is made of lightweight materials including aircraft grade aluminium gears that accommodate the natural gliding action of the knee. Neoprene sleeve provides therapeutic warmth and has a seamless, breathable back panel for improved comfort. Patellar support buttress helps improve patellar tracking. Fully adjustable Velcro straps ensure a perfect fit for your knee. My Verdict: This offers great protection at a very reasonable price. Users consistently give it top ratings because it is easy to apply, comfortable and effective. Average user rating 4.2/5. It is really important to get the correct size brace, otherwise it won’t stay in place properly, will not provide adequate support and will become uncomfortable. 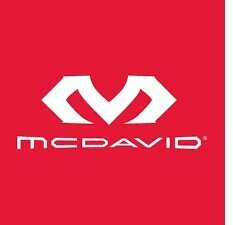 McDavid knee braces are either one size fits most or come in five sizes. To get an accurate fit, measure around the centre of the knee and chose from the options below. If your knee size falls between two sizes, it is usually best to go for the larger size for a better fit. There are other McDavid knee braces available, but they don’t all receive great feedback from users. All the ones I have chosen here get great reviews by people like you suffering from knee pain. If you’re not sure you’ve found the perfect brace for you, visit the Knee Brace Overview to find out more about the different types of knee brace available and about other manufacturers.